Although, the November period may mean different things to people across the globe in terms of weather, this article covers three important events that everyone across the globe should watch out for in this month of November. The following event days are worth looking out for this November and you should also check out the exciting facts about the Month of November towards the end of this article. Cyber Monday is a day set aside for people to take advantage of the convenience, discounts and all the mouth-watering incentives that online shopping has got to offer. "Cyber Monday" was created by marketing companies to persuade people to shop online. On this day, online shops usually offer customers with great discounts to enhance patronage and awareness. This year 2018 Cyber Monday will be coming up on the 26th of November. 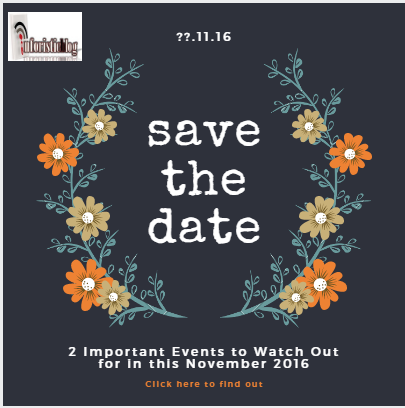 This year's event even promises to be big and you should watch out for it. According to Wikipedia, The term “Black Friday” was coined in the 1960s to mark the kickoff to the Christmas shopping season. “Black” refers to stores moving from the “red” to the “black,” back when accounting records were kept by hand, and red ink indicated a loss, and black a profit. For millions of people Black Friday is the time to do some serious Christmas shopping simply because of the great discounts and offers. In Nigeria, top online stores like Jumia and Konga usually begin Black Friday sales by November 14th and customers do enjoy lots and lots of incredibly low prices of up to 80%. For quick access to these discounts, it is better to shop using the Jumia App as the website may become slow on such days due to traffic. (Download the latest Jumia App here). November in the Northern Hemisphere is similar to May in the Southern Hemisphere. The third Thursday of November is the Great American Smokeout where smokers are encouraged by the American Cancer Society to stop smoking on this day. I am looking out for the World Top Up Day. I missed it last year. It's almost here, I will be sharing all the exciting details of this year's edition, Keep your fingers crossed.